In order to do our part in preventing the spread of the Swine flu, Armor Correctional Health Services will be giving a brief presentation at our DOD roll calls. Also, please refer to the attachment, prepared by Armor Correctional Health Services, for staff to become more informed about this potential public health threat. 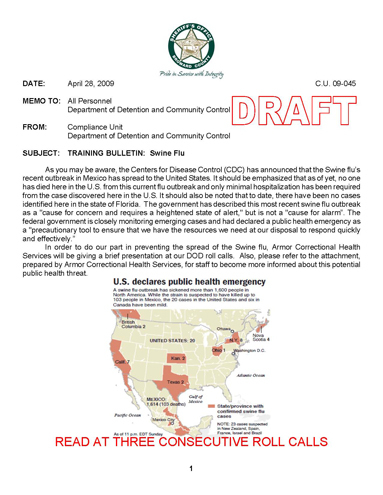 As a result of the declared U.S. Public Health Emergency, all health care staff is asked to be especially vigilant for any signs, symptoms, or complaints that could be Swine Flu. 1) Report the situation immediately to your facility Medical Director. 2) Consider isolation of the patient. 3) Report the occurrence to your facility’s Infection Control nurse. (prodriguez@armorcorrectional.com) or via facsimile (305-662-8039). In addition to early detection and close monitoring, good hygiene practices including frequent hand washing are essential during this early stage of what will hopefully be a limited epidemic. Swine Influenza (swine flu) is a respiratory disease of pigs caused by type A influenza viruses that causes regular outbreaks in pigs. People do not normally get swine flu, but human infections can and do happen. cases of swine flu infection in humans and cases have been reported internationally as well. An updated case count of confirmed swine flu infections in the United States is kept at http://www.cdc.gov/swineflu/investigation.htm CDC and local and state health agencies are working together to investigate this situation. with influenza. Sometimes people may become infected by touching something with flu viruses on it and then touching their mouth or nose. you know you are sick, as well as while you are sick.